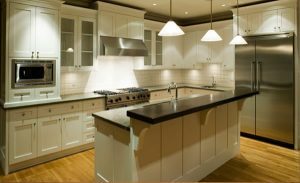 Check out our Shaker White kitchen cabinets. They have a simple, timeless finish that is perfect for any home. These cabinets are quality-built with mortise & tenon door construction, solid wood face frames, and dovetail drawer boxes. Full overlay doors complete these versatile cabinets. Coordinating bathroom vanities are also available. Lead time is only 3 weeks. Bring us your measurements and let us help you design and customize your new kitchen or remodel!